will a Allison 700 series bolt up to a 4000 series flywheel housing and flex plate? is a spacer needed ? If so what p/n ? also what is the tooth count on the 700 series speedometer? I cannot help you with part numbers and such, but I do have a 1996 Mack RD688S with an Allison HT 750 DRD in it from the factory. I can take some pictures of it if you need them. It is mated up to a E7 300. I would assume that the frames on our trucks are very similar. I am currently having some work done on the transmission, there is a company called Clarke Power that has facilities all around the United States. They specialize in Allison transmissions. You might give them a call, they’re doing my work and seem pretty knowledgeable. My local Mack has them do Allison trans work for them. 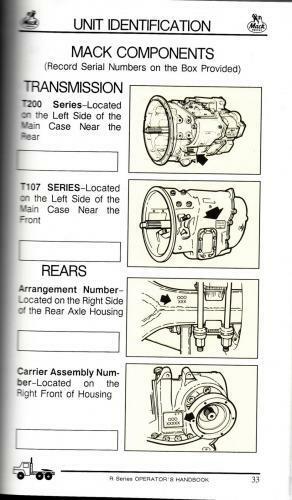 What axle ratio does your truck have ? Also does your trans have a rear support? I know the 4000 series requires one. i know that I need to pay close attention to tooth count on flex plate and tone ring/ speedometer gear to make things work. Sorry for the slow reply, been busy! I went to check the axle ratio and the sticker on the cab is not readable. Do you know where else the ratio might be located? I'll have a look for you. I know sometimes they're stamped on the differential somewhere...but if you can give me a hint that would save me a lot of time...plenty places that number could be! Ratio is stamped with "Carrier Assembly Number". Right front of housing. Sorry it took so long to get back to you. My axle ratio is a 4.17. And I don’t see a rear support. thanks for the info, i run a 4:42 so my top speed will be about 55mph or so at 1900, not so bad since my work is mostly within 30 minutes and in a 55 MPH work zone. i have finally got a contact who did this swap a few times on a Mack and they are able to answer all my questions about flywheel housing,flexplates and tooth counts to keep the E tech happy. Late to the party, but two things, are you considering the cable or electronic HT 750? If electronic why not a 4000 series, has 7 speeds with two overdrives and have the best of both worlds? If the old cable shift HT750 is what will work I get why. the 750 drd has a much lower 1st gear than the 4000 unless you jump up to the 4700, if i go with the 4000 series then i'll need a computer and harness and the cost is much more. i dont want to get into that, i want to keep it simple. the big issue i find now is price, I have been told $25000-$30000 by two different shops, i don't understand how that could be possible, especially if i find a donor truck. i should be able to find a single axle RD with a E-Tech and Allison for a fair price. Being this is a swap, I suspect the shops are just high balling the price so you won't be shocked if a lot of fabrication is needed and the labor hours take off. Oftentimes with older trucks like yours it's cheaper and a whole lot less headaches to simply sell the old truck and buy another one with the components you need. If that was the price I got it would be a BIG issue to. Thought my trans guy was a little high for a rebuilt dyno tested Allison at $7000. That is out right with $3000 core charge included. I do need to make an adaptor/ spacer ring between trans and engine, mount shifter. Have the drive shaft reworked for length but that is it. I am doing the trans in and out so just my time and plate of aluminum for spacer. No engine work needed as it is all mechanical. If all you are doing is swapping an existing engine/ trans into your truck that is a real high price in my book. Plus the cost of the donor truck.... No Way. Just keep you combo in that truck and put a good cut-off under the donor truck, if needed, and drive both. You'll be time and a lot of money ahead. Not to mention when you have service done in the future, no one will work on bastardized combo.